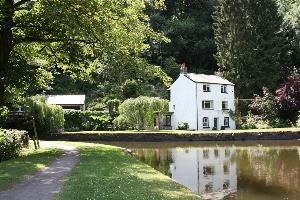 Lovingly renovated historic cottage in an idyllic location with gardens fronting the Monmouthshire and Brecon Canal. A beautiful kitchen with Aga, smart contemporary bathrooms, CH, two log burners, and superb furnishings combine to make this the perfect holiday home. Fishing, golf, pony-trekking, shooting, leisure club available nearby. Children welcome from any age. Abergavenny train and bus stations approximately 5 minutes taxi ride from property or 40 minutes walk. By road: 0.5 mile from A465/A40 junction to Abergavenny. Half an hour from junction 24 of M4 at Newport or half an hour from junction 4 of M50 ar Ross-on-Wye.